The best museum storage system preserves the integrity of your current collection while creating additional storage space for new acquisitions. Learn how we can help. The best museum storage systems preserve the integrity of your current collection while creating additional storage space for new acquisitions. Learn how we can help. Museum collections are widely varied and specialized. In almost every case, the amount of holdings in storage in a museum outweighs what is on display at any given moment. Space constraints are already a concern as collections increase within the same footprint, and as more museums look to the future of delivering personalized experiences to museumgoers, the need for organized, compact museum collections storage will be more important than ever. Along with our Spacesaver partners, we’ve had the privilege to store some of the most fascinating museum collections in the United States and beyond. From rare books to historic guns, furniture to whale bones, 6,000 lb. torpedoes to art collections, we’ve created countless museum collection storage solutions specifically designed to the unique needs of a variety of artifacts and acquisitions. From integrating storage with HVAC and fire suppression systems to creating special gasketing to seal off rare collections from damaging elements, our goal is simple: to design storage that puts both space conservation and collections conservation at the forefront. Take a look below at how San Francisco’s Asian Art Museum created a new museum collection storage solution when they relocated to the historic Main Library. When the Asian Art Museum relocated to the Main Library, it was to better protect and exhibit one of the largest collections of Asian art in the world. Because of the historic nature of the building, additional space for the 15,000 artifacts was non-existent—and changing the footprint of the building wasn’t an option. A high-density mobile storage system was put to use in conjunction with museum cabinets, both of which had been chemically analyzed to ensure safe preservation and storage compatibility. 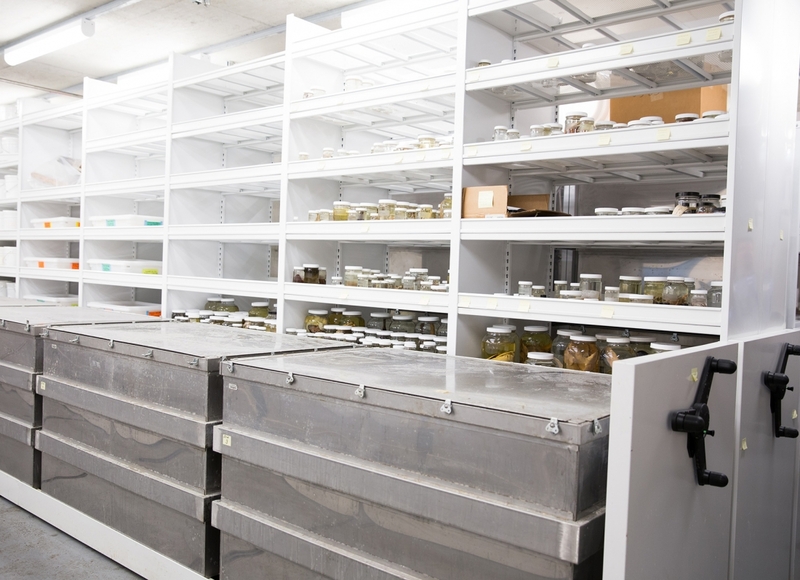 See how the California Academy of Sciences created a storage space that can endure an earthquake while still providing convenient access to their collections. In addition to the mobile storage, compact mobile art racks were installed at the Museum to double the amount of storage for framed artworks, and more than 200 environmentally-controlled museum storage cabinets were placed into high-density mobile storage systems for a range of artifact storage, including smaller items. To assist with further viewing of these items, a work surface solution was also developed to provide an expansive, angled shelf surface for large, flat, or rolled pieces of art. With an abundance of large statues that needed to be stored, the Asian Art Museum quickly realized that traditional metal shelving was unable to accommodate the weight of the collection. Versatile wide-span shelving was utilized to provide access to the large collections. Interested in learning more about how smart storage can preserve space and collections? Download our Museum Storage Lookbook to take a look at the possibilities.